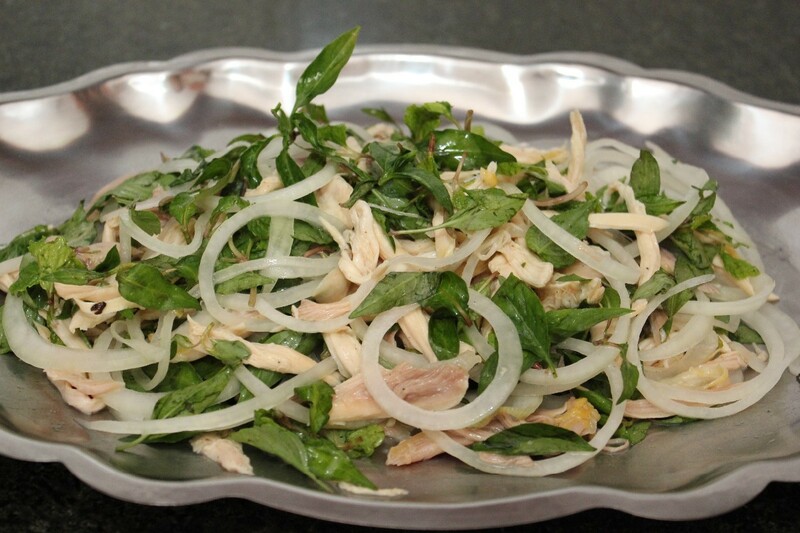 The fresh Asian herbs and spices give Vietnamese salads their distinctive flavors and colors. 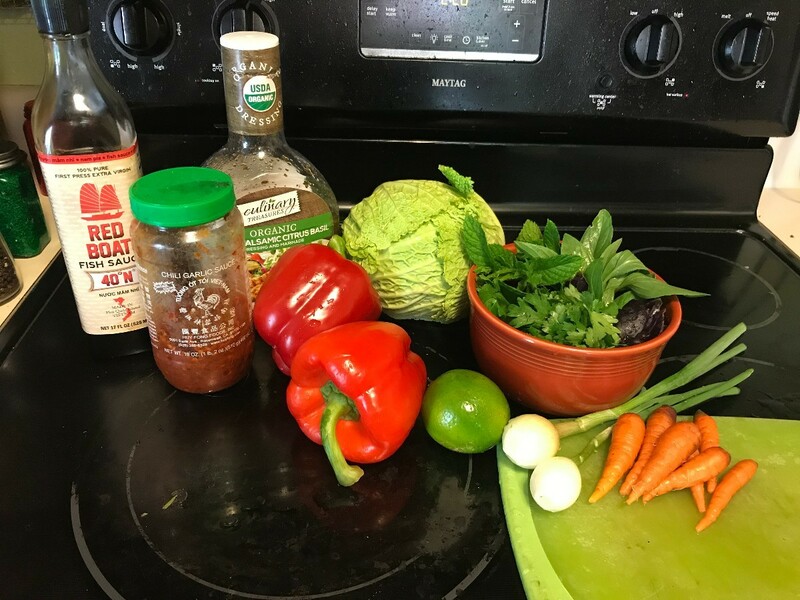 This page contains Vietnamese salad recipes. 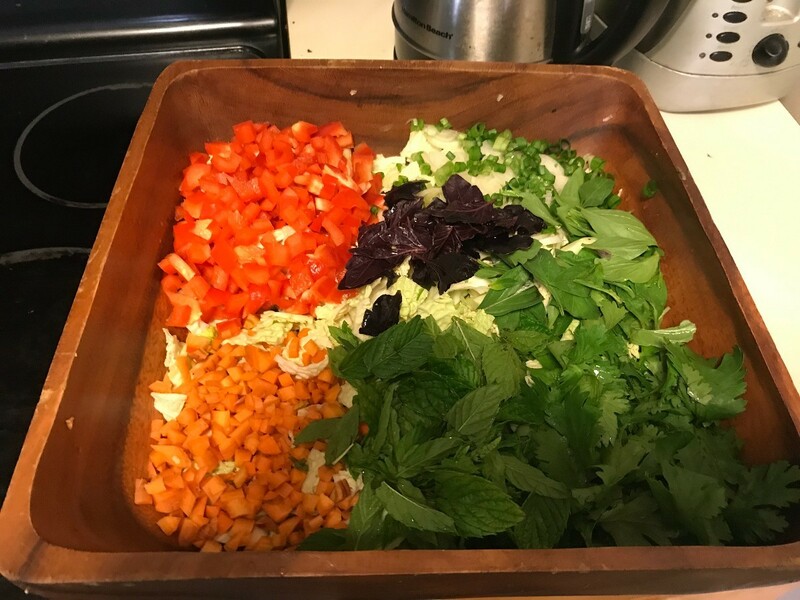 This recipe reminds me of all the wonderful herbs and when I visited Da Nang. It's so fresh and light and bursting with flavors. It's perfect on hot summer days but I enjoy it year round. I topped mine with grilled chicken. You could add any sort of Asian noodles to it if you wanted something more substantial. Those translucent rice noodles would be wonderful. Source: I based my dressing on my sister Stella's recipe. It's great if you want something more traditional. Go easy on the fish sauce and the chili garlic paste if you are not used to them. A little can go a long way. You can always leave these out and just use the dressing alone. *My carrots were very small and my spring onions were gigantic. The ingredients call for the more standard sizes that are generally available. Cut the vegetables in bite sized pieces. 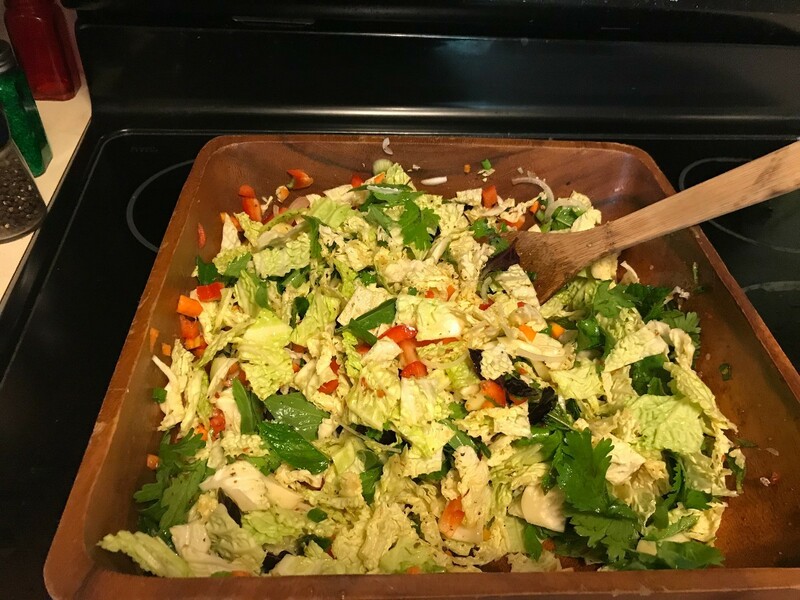 I diced all the larger vegetables, except for the cabbage which I sliced thinly, then coarsely chopped. Add to salad bowl. Remove the leaves from the herbs' stems and wash them. Add the washed herbs to the salad. I leave the leaves whole if they are small and tear larger leaves. Add to the salad. Juice one lime. 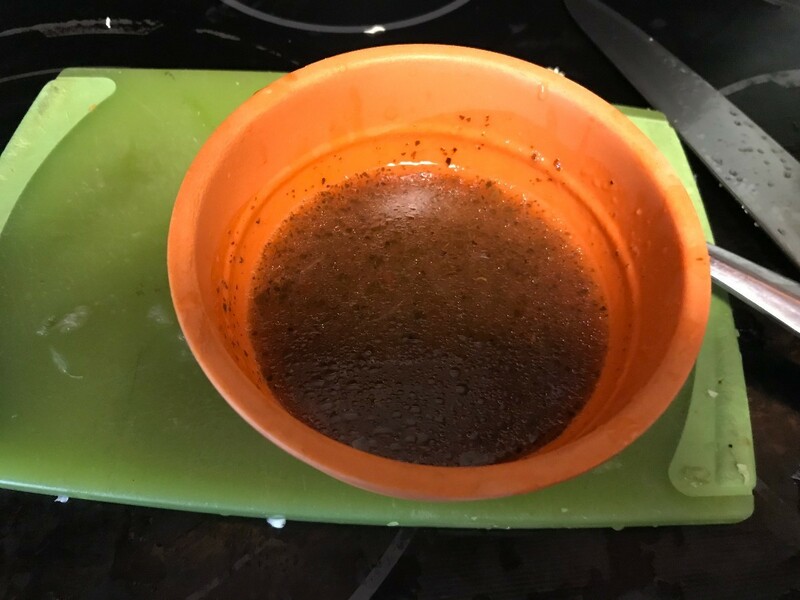 Combine bottled vinaigrette, fish sauce, chili garlic paste, and the lime juice in a small bowl until mixed. Taste and adjust seasonings, as desired. Pour dressing over salad greens and toss thoroughly. Serve immediately or allow the flavors to develop overnight. It's wonderful for potlucks! 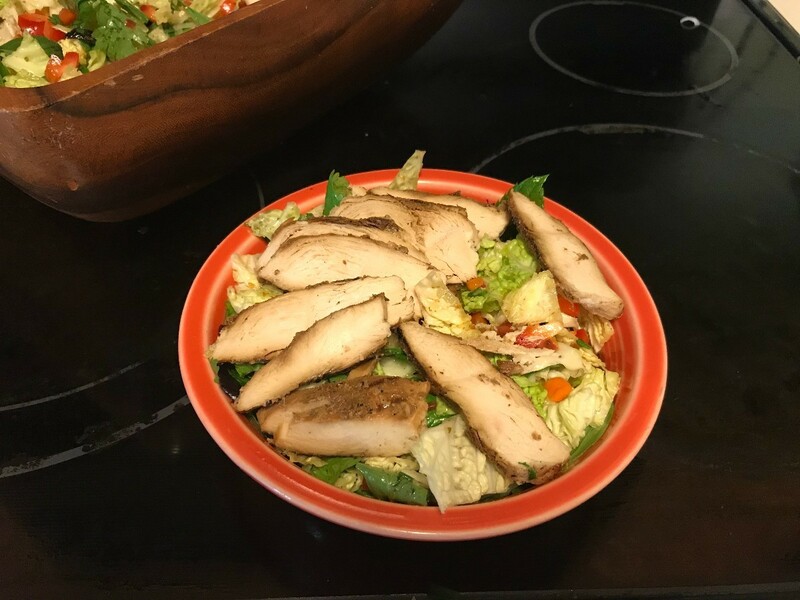 This delicious chicken salad is fresh with Asian herbs and seasonings. This is a guide about making Vietnamese chicken salad (goi ga).